THE B-MOVIE NEWS VAULT: Roger & Julie Corman Have Sold the Entire New Horizons Library to Shout! Factory and ACE Films HK! Roger & Julie Corman Have Sold the Entire New Horizons Library to Shout! Factory and ACE Films HK! SHOUT! FACTORY AND ACE FILMS HK ACQUIRED NEW HORIZONS' ENORMOUS CATALOG OF 270 FILMS! Ack! I got this news just before I had to head off to the day job, so I missed the opportunity of being one of the first to report it! This announcement is HUGE, because it looks like a large number of Corman flicks may finally make their way to Blu-ray Vault Dwellers! It was announced earlier today that both Shout! 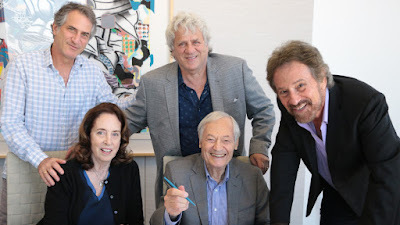 Factory and China-based Ace Film HK Company Limited (henceforth known as ACE) purchased the entire New Horizons library of TWO-HUNDRED AND SEVENTY FILMS (plus an action Sci-Fi TV series) from Roger and Julie Corman. The deal gives Shout! distribution rights in North America, Europe, Australia, and Russia, while ACE will handle distribution in Asia, Africa, and South America! Shout! Factory has already released a number of Roger Corman Cult Classics to DVD & Blu-ray in the past (e.g. BATTLE BEYOND THE STARS, PIRANHA, HUMANOIDS FROM THE DEEP, SLUMBER PARTY MASSACRE, DEATH RACE 2000, et al. ), so I'm assuming that we can expect Blu-ray and DVD releases of these newly acquired titles! On top of that, both companies are planning to license the New Horizons catalog to video on demand and streaming platforms, and are planning on remaking several Corman classics (via Shout! Studios and/or ACE Films)! “We’ve been huge fans of the Cormans. Their great ingenuity and independent spirit have inspired us throughout our careers. We’ve loved working with them over the last eight years and are thrilled to now be the custodians of these beloved films, making sure that film buffs and fans everywhere discover them like we did." “We have been fortunate to be professionally and personally associated with Roger and Julie for the past decade and the purchase of their film library means our relationships will not only continue, but accelerate." "During the past decade our personal and professional relationships with Shout! Factory's Bob Emmer, Richard and Garson Foos, and Ace Film's Henry Luk and Adam Yuchen Ren have shown us that their independent, entrepreneurial spirit, respect for our work and creative methods of distribution and production make them especially well-suited to carry on with the New Horizons film library." Roger and Julie signing over the New Horizons library. The saga of legendary producer-director Roger Corman, recipient of a 2009 Honorary Academy Award, ranks as one of the most amazing motion picture success stories. Having produced more than 350 films and directed 60 others, his influence on American film goes far beyond his own energetic, creative low-budget movies. He is arguably one of Hollywood’s most gifted and masterful filmmakers, having launched the career of many others. Noted for his keen ability to spot young talent, Corman’s most lasting legacy will undoubtedly be the legion of producers, directors, writers and actors he has fostered, among them: Jack Nicholson, Francis Ford Coppola, Robert De Niro, Martin Scorsese, James Cameron, Ron Howard, Peter Fonda, Jonathan Demme, Gale Anne Hurd, Diane Ladd, Tommy Lee Jones, Harry Dean Stanton, Sandra Bullock, Bruce Dern, Talia Shire, Charles Bronson, Joe Dante, Peter Bogdanovich, and Sally Kirkland. Julie Corman's career spans 45 years with New Horizons. As the producer of over 35 films she has worked with: Jonathan Demme, John Sayles, Catherine Hardwicke, Robert King, Bill Pullman, Martin Sheen, Peter Billingsley, Jon Lovitz, and Mario Van Peebles, among others. She was Chair of the Graduate Film Department at NYU. For a more complete history of Roger Corman and his colorful career as an independent Producer and Director, I highly suggest the documentary, CORMAN'S WORLD!